If you own a CD or DVD player you will want tips for cleaning discs, especially if you find your favorite disc is scratched. Why Should You Clean Your Discs? CDs and DVDs get dirty and scratched. Dirt and scratches can interfere with a disc's ability to play with out skipping. 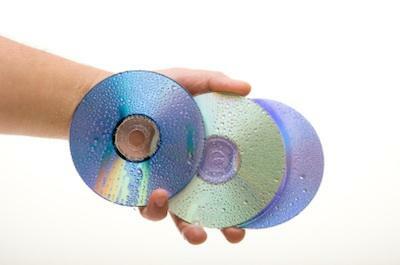 A CD is a compact disc that may contain digital information such as documents, pictures, or music. Devices that utilize compact discs are home and car stereos, and computers. A DVD is digital video device disc that contains video. Devices that utilize DVD discs include DVD movie players and computers. Over time, through handling, discs get covered with oil from your hands, dirt, and grime that could cause a CD or DVD to skip. Cleaning your discs will prolong their life and ensure decent play back. Following are various tips for cleaning discs. You can start with the first method and progress through the list until you find one that works on your disc. When an important disc gets scratched you can panic, or try to repair it. Scratches in discs may be able to be repaired by a scratch repair kit.Scratch repair kits come with a polish or gel that cleans and fills the scratch until it hardens so the disc can be read in the player. Purchase a scratch repair kit at most video rental stores and department stores. If you are able to fix the scratch so the disc can be read, you should make a copy of it as soon as possible in case the scratch reappears. Properly storing, handling and transporting your discs will reduce the amount of cleaning and replacement you need to do. When thinking about tips for cleaning discs, you should consider avoiding products and habits that will damage your disc further. Never use hydrogen peroxide to clean your disc because of its abrasive qualities. Avoid using baking soda, metal cleaners, or abrasive pads. Never leave your disc in a hot car in direct sunlight; it may warp. Clean your CD or DVD player with a head cleaning kit. If you have a disc that contains important information with no back up… call a professional to clean and retrieve the information from the disc.